When we think about hip mobility in yoga, we often think about a forward folded Eka Pada Rajakapotasana (One-Legged King Pigeon Pose) to stretch some of the hip rotators. But don’t forget that the hips do more than just rotate! Our hips can do all the major movements—flexion, extension, adduction, abduction, and internal and external rotation—so they can be mobile in several ways. When trying to mobilize the hips, figuring out which of these movement choices we’d like to explore helps us focus our efforts to be more effective. Not all hip mobilizing asanas affect the same anatomy. So how do we keep track of it all? There are three planes of motion: sagittal, coronal and transverse. Let’s take a look at the sagittal plane first. (We’ll look at the other two in future posts.) Sagittal plane movements are forward and backward movements in the hip, or flexion and extension. When we talk about mobility, we are talking about stretching or lengthening muscles. Remember, the motion opposite to the action of the muscle will stretch it, so we will be extending to open the flexors and flexing to open the extenders. Most yoga poses for mobilizing the hips on the sagittal plane will focus on the front of the hip or the flexors: iliopsoas, rectus femoris, some tensor fasciae latae, and even a little bit of the adductor muscles. Check them out below. All of these muscles contribute to flexing the hip joint. 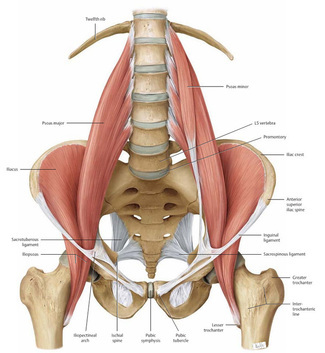 The hip extenders consist of mainly the gluteus maximus and hamstrings. They generally don’t need as much stretching as the flexors do. They are pretty stretched out already in most people. We are always sitting around, so our hips are flexing a lot. However, any forward folding (Uttanasana (Standing Forward Bend Pose), Paschimottanasana (Seated Forward Bend Pose), Adho Mukha Svanasana (Downward Facing Dog Pose) or knee-into-chest type poses, Apanasana (Wind-Releasing Pose) will stretch the backs of the hips. But what about stretching tight hamstrings? We’ll have to save that discussion for another post! Yoga poses that extend the hip joint will create opening and stretch the front of the hips in the sagittal plane. These poses will involve mostly lunges and backbends like the ones pictured below. Mobilizing our hip flexors properly will help us move into more complicated asanas. Opening the front of the hips in the sagittal plane will definitely support our backbend practices. Think Vrschikasana (Scorpion Pose), Eka Pada Rajakapotasana, and Natarajasana (King Dancer Pose). Also, more information on hip mobility in part 2 by Dr. Nolan Lee - Yoga Asana for Hip Mobility, Part 2: Spotlight on Adduction & Abduction. Part 3 of this series from Dr. Nolan Lee: Yoga Asana for Hip Mobility Part 3: Spotlight on Internal and External Rotation. Dr. Nolan Lee is a yoga teacher and physical rehab specialist in Chicago, IL with an extraordinary passion for understanding how the body moves and functions. Nolan has the unique ability to blend the science of anatomy with the art of yoga. With an active practice at this clinic, Balanced Flow Wellness, he practically applies yoga to restore and maintain health. Dr. Lee also holds a Master of Acupuncture degree and is a NASM certified corrective exercise specialist (CES). He enthusiastically shares his knowledge of yoga and anatomy in lectures, workshops and on his blog.